CBMN | Nicolas Desbenoit, new associate scientist at CBMN. Nicolas Desbenoit, new associate scientist at CBMN. Nicolas Desbenoit studied organic chemistry at the University of Orsay (Paris XI). He received his PhD from the University of Paris Descartes (Paris V) in 2009. After several post-doctoral stays in France (ICSN/CNRS), and in Germany (University of Justus-Liebig, and University of Bayreuth), Nicolas Desbenoit was recruited as a CNRS Chargé de Recherche in 2016 at CBMN (UMR 5248), and he joined team of Prof. M. Bonneu and Prof. J.-M. Schmitter (Spectrométrie de Masse des Macromolécules Biologiques) in January 2017. His current research is focused on the development of the mass spectrometry imaging for the detection of lipids, metabolites, drugs, neurotransmitters present at the surface of tissue sections. 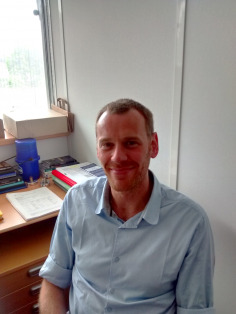 He also will work on the development of the multimodal imaging combining the vibrational spectroscopies (Raman / FT-IR, collaboration with S. Lecomte team) and mass spectrometry.